The image shows cells (blue - nucleus shown in white) that are full of damaged mitochondria (red). Some of the damaged mitochondria have been targeted by the autophagy receptors (green), which accumulate faster through the process revealed in the paper. Credit: Dr Padman at Monash Micro Imaging. Monash researchers have unlocked a key process in all human cells that contributes to diseases like cancer and neurodegenerative diseases as well as ageing. The discovery reveals how cells efficiently get rid of cellular junk, which when it accumulates, can trigger death and the health problems associated with getting older. Autophagy is the 'clean-up crew' of the cell—used by cells to break-down debris like broken proteins, bits of cell membrane, viruses or bacteria. To capture this trash, cells use specialised membranes to trap the cargo for recycling into new parts and energy. 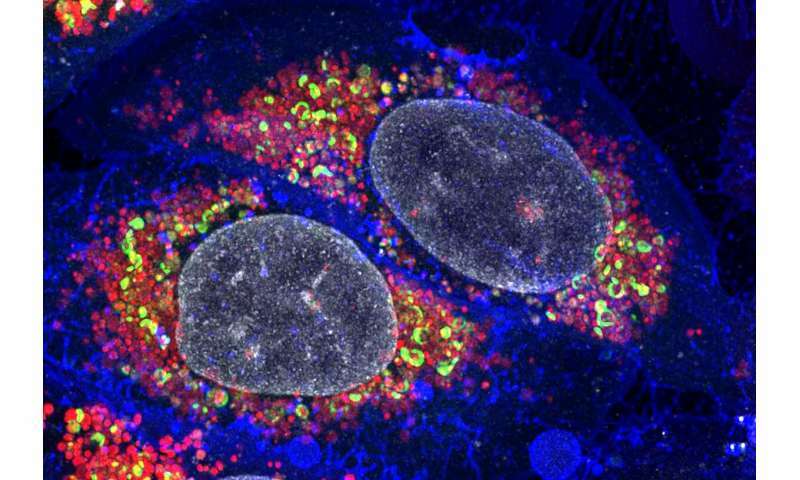 Without efficient autophagy cells become choked by their own damaged components, which can contribute to the development of a range of diseases, including diabetes, muscular dystrophy, Parkinson's and Alzheimer's disease. Dr. Michael Lazarou's laboratory from the Monash Biomedicine Discovery Institute have today published data in Nature Communications that debunks previously held beliefs about how cells target their trash. Cells target different types of cargo by using 'autophagy receptors', which can bind the cargo as well as the ensnaring membranes. Until recently these autophagy receptors were thought to recruit the membranes to the cargo, but research led by Dr. Benjamin Padman from the Lazarou lab now shows that this is not the case. Dr. Padman removed the ability of autophagy receptors to bind the membranes—and found that this did not halt the autophagy process. In collaboration with Dr. Lan Nguyen, head of the Monash BDI Computational Network Modelling Laboratory, the researchers have instead discovered how cells amplify the rate of autophagy. "It totally flipped the way I used to think about it," Dr. Padman said. "The autophagy receptors weren't recruiting the membranes, the membranes were recruiting more autophagy receptors to speed things up," he said. According to Dr. Padman, there are a number of treatments and therapies currently under development globally which aim to control the activity of these proteins, "which according to our findings, don't function the way we previously thought." "The clean-up crew of autophagy is always hard at work in our cells, but it can sometimes have trouble keeping up. If we can find drugs that target this amplification mechanism, we could help neuronal cells deal with the build-up of protein trash linked to Huntington's and Alzheimer's," Dr. Padman said. Protein identified that can lengthen our life?